“I cannot get swayed by the gravity of the incident once I get a call of duty from the court. The judges have entrusted me with a duty to satisfy its judicial conscience. The court felt that everything should be done to give a fair hearing to the convicts on the merit of the case and also on the point of sentence. I will ensure that" Senior lawyer Raju Ramachandran who will represent convicts Mukesh, Pawan. “The incident is outrageous. But all accused are entitled to all due process of law and if the court requires me as an amicus, I will do the best of my ability to ensure every accused gets the best representation", Senior lawyer Sanjay Hegde who will represent Vinay and Akshay. 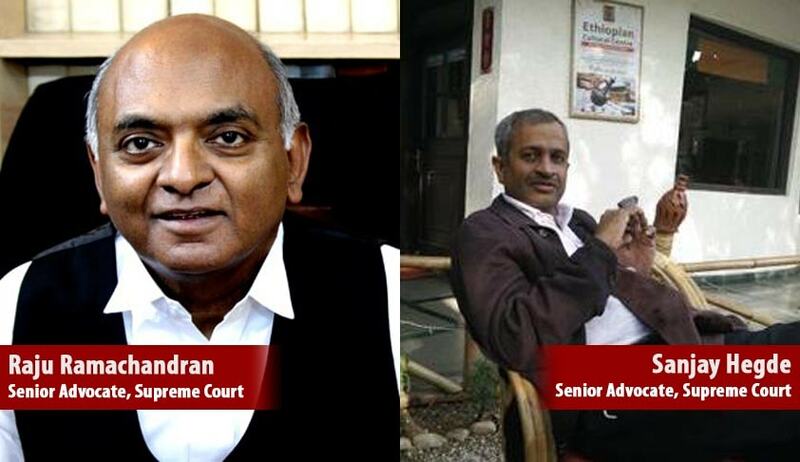 Well known senior lawyers Raju Ramachandran and Sanjay Hegde who have been appointed by the Supreme Court special bench hearing the Nirbhaya case to argue the appeals filed by four death row convicts have said they are only going by the dictum that whatever be the crime, every accused is entitled to a fair trial and proper hearing. It is to be noted that Supreme Court in several other similar cases has repeatedly said a trial in which an accused does not get an opportunity to properly defend himself can be declared invalid from the outset. Reacting to the appointments by a three-judge bench headed by justice Dipak Misra, legal experts say that the judges are only being cautious and is ensuring that the convicts do not take a ground in the end that they could not get a proper hearing and adequate legal aid, the common defence where a convict is facing gallows. Senior lawyer Raju Ramachandran who has been asked to argue the appeal of convicts Mukesh, Pawan said : “It is a call from the court. It is a call of duty as an officer of the court. I cannot get swayed by the gravity of the incident once I get a call of duty from the court. The judges have entrusted me with a duty to satisfy its judicial conscience. The court felt that everything should be done to give a fair hearing to the convicts on the merit of the case and also on the point of sentence. I will ensure that"
Senior lawyer Sanjay Hegde who will represent Vinay and Akshay said: “The incident is outrageous. But all accused are entitled to all due process of law and if the court requires me as an amicus, I will do the best of my ability to ensure every accused gets the best representation"
The apex court had begun hearing the appeals four days ago after keeping it in cold storage for two years. The bench said the appointments were made to ensure that there were no “inadequacies” and the convicts are ensured a “full and fair” hearing. “Considering the gravity of the case and the questions of law involved as every new fact is churning up issues, we deem it fit to appoint senior lawyers to assist the court and appear on behalf of the accused”, said three -judge Bench comprising Justices Dipak Misra, V Gopala Gowda and Kurian Joseph. “We have tremendous faith in their abilities ( of the lawyers who represented them earlier). They also claim they are capable but the whole purpose is to lay down all propositions in this case which the court has not got in its prism”, Justice Misra told Ramachandran. As per procedure, the apex court also needs to confirm the capital punishment and only then the four convicts can be hanged. The juvenile convict has already walked free after serving three years at a juvenile home while another accused – Mukesh’s brother Ram Singh – committed suicide inside Tihar Jail during the trial.